Upon reading President Monson’s narrative about Jesus where he stated that “the angry mob took His life,” someone well-acquainted with the story of Joseph Smith’s death remarked, “It sounds like Monson is confusing his saviors.” Interesting thought. This entry was posted in Joseph Smith, LDS Church and tagged Angry Mob, Church of Jesus Christ of Latter-day Saints, General Conference, Joseph Smith, Martyrdom, Mormon History, Mormonism, Thomas S. Monson. Bookmark the permalink. That’s the first thing I thought about was the attempt to link Joseph with Jesus. 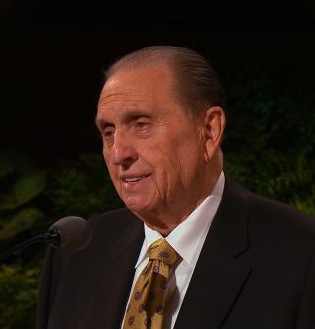 I think that was the point of what Monson was saying. The LDS do not know who Jesus is. They have this caricature of “the Savior” who is basically a valiant older spirit brother who provides a good example. Jesus, to the LDS, is not God incarnate. I would think the LDS folks would wise-up and do a little digging into both the Bible and the writings of the early Church Fathers instead of depending on these self-proclaimed “prophets”. A very fine post, Sharon. In reading of Jesus’ life being “taken,” I was reminded of John 10:17-18. In this passage, Jesus explains that no one can take his life, but that he voluntarily shall sacrifice it. In speaking of Jesus, the LDS prophet states several very true things that Jesus did, including, “the sinner He saved.” That is indeed good news. What puzzles me is this: the LDS prophet affirms he believes this, so why have LDS leaders reacted negatively when Christians invite sinners to come to Jesus to be saved from judgment and condemnation? Have LDS leaders invited people to come to Jesus to receive this salvation? No. They do not seem to have salvation because they have never received it. The Bible speaks of the gift of God in Romans 6:23. What is this gift? Did you see it in the verse? Have you received it? What better time to receive God’s gift than at Christmastime. My name above links to a presentation of this gift, explaining how you may receive it and know God personally. This is the best Christmas present. Whenever I have watched movies (non-LDS) they have always depicted a town square full of people all yelling against Jesus, so it appears that it is not only the LDS perspective. But in the Bible it states ‘multitude’ in Matthew, ‘the people’ in Mark and Luke and ‘the Jews’ in John. It also states that they all were crying out to Pilate to have Jesus crucified. To me this sounds more like an angry mob than how you describe it. Yes the Sanhedrin/Pharisees riled them up, but it was a multitude (Matthew – a synonym for this is mob) that yelled out to Pilate to crucify Jesus (Matthew, Mark, Luke, John) and Pilate, to appease the people, complied (Mark). Matthew 27:21-23 The governor answered and said unto them, Whether of the twain will ye that I release unto you? They said, Barabbas. Pilate saith unto them, What shall I do then with Jesus which is called Christ? They all say unto him, Let him be crucified. And the governor said, Why, what evil hath he done? But they cried out the more, saying, Let him be crucified. Mark 15:11-15 But the chief priests moved the people, that he should rather release Barabbas unto them. And Pilate answered and said again unto them, What will ye then that I shall do unto him whom ye call the King of the Jews? And they cried out again, Crucify him. Then Pilate said unto them, Why, what evil hath he done? And they cried out the more exceedingly, Crucify him. And so Pilate, willing to content the people, released Barabbas unto them, and delivered Jesus, when he had scourged him, to be crucified. Luke 23:13-23 And Pilate, when he had called together the chief priests and the rulers and the people, Said unto them, Ye have brought this man unto me, as one that perverteth the people: and, behold, I, having examined him before you, have found no fault in this man touching those things whereof ye accuse him: No, nor yet Herod: for I sent you to him; and, lo, nothing worthy of death is done unto him. I will therefore chastise him, and release him. (For of necessity he must release one unto them at the feast.) And they cried out all at once, saying, Away with this man, and release unto us Barabbas: (Who for a certain sedition made in the city, and for murder, was cast into prison.) Pilate therefore, willing to release Jesus, spake again to them. But they cried, saying, Crucify him, crucify him. And he said unto them the third time, Why, what evil hath he done? I have found no cause of death in him: I will therefore chastise him, and let him go. And they were instant with loud voices, requiring that he might be crucified. And the voices of them and of the chief priests prevailed. John 18:38-40 Pilate saith unto him, What is truth? And when he had said this, he went out again unto the Jews, and saith unto them, I find in him no fault at all. But ye have a custom, that I should release unto you one at the passover: will ye therefore that I release unto you the King of the Jews? Then cried they all again, saying, Not this man, but Barabbas. Now Barabbas was a robber. You’re being influenced by movies in your thinking? I always knew it was the government, religious and secular, that crucified Jesus. The mob didn’t crucify Jesus. The “mob” were useful idiots employed by the religious leaders for their own political end. They were probably a “rent-a-mob” that we see quite often here in the United States. Mormons have an idealized view of Joseph Smith’s murder. Most often they don’t even know why he was in jail; the precipitating event. They chalk it up to persecution. Next they don’t know that he was armed as were his associates and they fought back. I think he had the right to defend himself, but he wasn’t passive. He discharged his weapon as did those with him. Lastly, he was bailing out the window to escape. Again I can’t fault him for this. I sat next to the window at the Carthage Jail that he was jumping out of when he was shot. It’s a pretty good distance to the ground actually. Now that was a mob that broke into the jail and fought its way up the stairs to the top floor where Smith was. 19th century America was a wild and wholly place as other events leading up to the Civil War can testify to. Finally, Jesus died for our sins. Joseph Smith died because of his own sins. I’m continuing to pray for you Ralph that the Lord God will reveal Himself to you and that you will receive the gift of eternal life through faith, that he is offering you. It is for you and your family! if in what Monson said about how Jesus died was meant to subtly draw a connection to Joseph Smith then that should’nt surprise anyone . In my own study of Mormonism years ago it did’nt take long to discover that Mormons have a view of Joseph Smith that is a bit over the top , and that is a red flag to me and I came to a conclusion something was amiss with this religion . Further examination of Mormonism added to my conclusion . People should realize that they don’t need Joseph Smith or the church he claimed to restore . A right relationship with God , forgiveness from Him , peace with Him , and receiving eternal life to live in His home above is available outside of Mormonism . There’s a huge difference between a relationship with the Lord Jesus Christ and the religion of Joseph Smith . Mob vs. not-a-mob concerning Jesus’ end. Interesting topic but……………………………………………….. The real challenge for Mormons is coming to an understanding of who Jesus is. Because if someone thinks it was a mob or not-a-mob isn’t going to have any effect on that person’s salvation. What it’s going to come down to is recognizing that Jesus is God incarnate and salvation is secured by placing faith in Him…..alone. No works can be added to what Jesus has done for us. Mormonism has a two level sequence of salvation. There’s universal salvation granted to everyone who has ever lived regardless of how they have lived and or if they don’t have any faith. The second level is the Mormon god-maker program which is totally dependent on works; doing the system. So for any questioning Mormon who is reading this, find out who Jesus is and what salvation through faith in him is all about. Like Brian said, no mob or government or religious leader could take his life. All he had to do was say the word and they’d all have been dust. No, that’s the whole point; He gave his life willingly for us. If you want to get technical, we ALL are the reason he was on that cross, not just some “angry mob”. It was Sharon that made it out to be about JS, not President Monson. What I tried to do in my last post was to have the Bible speak for itself. As I wrote it uses the word multitude, for which mob is a synonym; and the multitude was crying out (or in other words yelling) for Pilate to crucify Jesus. Now if that isn’t an angry mob calling for His death then what is? But just to show it isn’t just an LDS perspective here are a few other sites, some of which are Christian sites, that say it was an angry mob or crowd. These are just the ones I could copy/paste portions. If you Google ‘angry mob Jesus crucifixion’ or ‘angry crowd Jesus crucifixion’ you will find many more. Jesus asked forgiveness for the angry mob that had mocked Him, jeered Him, and called for His crucifixion (Mark 15:29–30). A. Jesus is condemned to crucifixion. 1. (1-4) Pilate hopes to satisfy the mob by having Jesus whipped and mocked. Later, when Pilate attempted to release Jesus Christ, they vehemently insisted that He had to be killed, and the angry crowd that was present, as well as the priests, finally prevailed. “But with loud shouts they insistently demanded that he be crucified, and their shouts prevailed” (Luke 23: 23 NIV). Pilate knew this for he said, “I find no fault in this man.” But the angry mob was not satisfied. Although Pilate found him not guilty the Jews, encouraged by the priests and elders, demanded that Jesus be crucified. Fearing a violent reaction by the angry mob of Jews, Pilate had Jesus flogged and sent to the cross to be crucified. These show that it’s a pretty universal belief that what it states in the Bible means and angry mob/crowd/multitude. So as I said, President Monson, and the LDS church, were/are not comparing Jesus’ crucifixion with JS death in this talk – it was Sharon that was taking things out of context and making that assumption, which you are now parroting. I am not sure I find this to be a big deal. I get Ralph’s point, but I am not sure it actually was a mob that killed Jesus. The religious leaders and the Roman government killed Jesus, and the Jews used a multitude to convince Pilate to turn Jesus over for crucifixion. Its a subtle difference, but a difference nonetheless. And it is absolutely clear that Jesus was killed by the Romans while upon the cross, many believing the centurions spear in his side essentially giving the final blow. He may have been jeered while dying, but that is not what killed him. Roman torture killed him. Smith, however, was killed when a mob ran amok in the jail. They came for him, and Smith was apparently shot in the melee. It is more accurate to say that Smith was killed by a mob than it is to say Jesus was killed by a mob. Besides the usual lifting up Smith to Jesus’s level, I am not sure the importance of the discussion/comparison. Ralph, it would be good if you would re-read the portions of this blog post that are my editorial comments. You suggest that I left no room for the presence of an “angry mob” or multitude in the biblical account of Jesus’ trial and crucifixion; you accuse me of taking things out of context; and you believe I said (or assumed) that President Monson was purposely comparing Jesus’ crucifixion with Joseph Smith’s murder. But I don’t see me having done any of those things. I said it was unusual (i.e., “not habitual or commonly occurring”) to hear someone say that Jesus’ trial and crucifixion were “perpetrated” (i.e., “carried out or committed”) by an angry mob. As I explained, Jesus was executed by the Roman government – not by an angry mob (He Himself, of course, laid down His own life). Yes, a multitude gathered to watch the trials, and some of those people called for Jesus’ death, but the “angry mob” did not “take his life,” and it is unusual to hear His crucifixion expressed in this way. But within the context of Mormonism, President Monson’s phraseology is very often heard describing the death of Joseph Smith. So much so that when I read the Ensign article, his wording immediately brought Joseph Smith’s death to mind. I wondered if others would have the same experience so I passed the magazine around, asking friends what they thought. Among the half-dozen people I asked, the subtle connection to Joseph Smith was universal. One person’s response seemed quote-worthy – so I included it in the blog post. It is an interesting thought, and one that I figured had the potential to generate a good discussion. I think your response to this, Ralph, underscores my point – the “angry mob” phraseology for Mormons, by itself, evokes a comparison or connection between Jesus’ death and Joseph Smith’s murder. I didn’t say that “President Monson, and the LDS church, were/are…comparing Jesus’ crucifixion with JS death in this talk.” I don’t think President Monson’s comment was a conscious effort on his part to say anything other than what he believes about Christ’s crucifixion. Nevertheless, for Mormons and those who know Mormonism well, his words–perhaps unwittingly–evoke that comparison. I didn’t say the talk was endeavoring to compare Jesus’ crucifixion with Joseph Smith’s death; you came to that conclusion on your own. given him way too much prominence . Thus Mormons could see a connection to Joseph Smith in what Monson stated about how Jesus died . We know Mormons see Joseph Smith in such a light that we can’t subscribe too , and hope that one day they won’t either . I need to repeat the truth here : no one needs the prophets of Mormonism . A right relationship with God is available to all who come to His Son . The claims of Mormonism ( complete apostasy , thus the gospel needing to be restored , Mormon prophet restored it etc ) is something we would expect a latter days prophet(s) , who were not sent by Jesus , to claim . Ralph , we pray for your spiritual freedom . Mormonism is not the answer . My point does not underscore your point that the LDS would think of JS. I said that the mob called out for Jesus to be crucified and Pilate complied – I too never said the mob killed Jesus. My point was that there was an angry mob calling out for His death, because it appeared that you thought there wasn’t, that you thought it was a small handful of people. I never compared the two deaths. As far as you not making a comparison, if you were wanting to be neutral then you should not have written anything about JS and his death, especially the last comment made by another person. You should have left it up to the readers to direct the conversation in that direction. It is you that steered the conversation to the path of comparison because you did write in about JS and what someone had commented. Even Falcon’s first comment said that “That’s the first thing I thought about was the attempt to link Joseph with Jesus.” and Falcon’s comment was first off the bat thus not influenced by others. So even Falcon saw that your article was making a comparison between the two. Also, you said in your last comment to me –“I think your response to this, Ralph, underscores my point – the “angry mob” phraseology for Mormons, by itself, evokes a comparison or connection between Jesus’ death and Joseph Smith’s murder.” If the point of your article, according to this comment, was to show that President Monson and LDS take the phrase ‘angry mob’ to be a comparison/or indicative of both the death of Jesus and JS, then why do you deny it in your first paragraph – “and you believe I said (or assumed) that President Monson was purposely comparing Jesus’ crucifixion with Joseph Smith’s murder. But I don’t see me having done any of those things.” What was your point again? That the phrase ‘angry mob’ evokes a comparison or connection between Jesus’ death and JS murder for LDS. So if President Monson used it it must have been on purpose then, else why would he use it in that way and why would you point it out? But no, I can tell you that phrase does not evoke any kind of comparison for me, or anyone else I know between Jesus’ death and JS death. As far as my thoughts about who killed Jesus – well literally it was the Roman government, but why – to placate the Jews that called for His blood, who were under the influence of the Sanhedrin who were jealous of Jesus and wanted Him killed. So all three parties had Him killed in my perspective. If a mafia boss told his second to hire a hitman to kill someone, who killed the person? The hitman, but the underlying killer was the mafia boss and the go-between was complicit as well as all three had a choice not to go through with it. And that is how the law looks at it as well, they would follow the clues from the hitman back as far as possible. No, they were not jealous. They saw him as blasphemous and heretical. It was customary to kill those types under Mosaic law. As I understand it, the Jews knew he could not be killed under Roman law and so had to get him under their jurisdiction. They convinced Pilot to give Jesus to them so they could have him killed. Once achieved, he was able to be killed. Now, as to comparisons between Smith and Jesus, its clear LDS think quite highly of Smith, almost to the point of equating him with Christ. Is that apparent from Monson in this context? I don’t know, but given everything else, who can blame one for making the connection? I seem to be communicating poorly on this. Please bear with me as I try once more. My OP was about the phraseology President Monson used in his statement. It was not really meant to communicate anything beyond that. I did not address President Monson’s intent, and I did not address the Church’s intent. That is, I did not make a statement suggesting that President Monson’s phrasing was intended to have a specific effect on readers. It did have a specific effect on me, as I mentioned in yesterday’s comment to you. It did have a specific effect on the people I asked to supply feedback. And it has had a similar effect on some Mormon Coffee commenters. In the end, this whole thing (the phraseology) is nothing more than a curiosity. As falcon has pointed out, what really matters is coming to know Jesus as He truly is, and finding salvation by faith in Him alone. Brian said this gift of God is the best Christmas present. Amen to that! Mormons should be well familiar with mob actions as that is what we could describe the Mountain Meadows Massacre as. For those unfamiliar with that infamous chapter in Mormon history, an innocent number of folks in a wagon train were brutally murdered by a band of Mormons in Utah. Actually this probably wasn’t a “mob” in the sense that these Mormons were well organized and had a plan. It was a brutal assault. Another “mob” could be those Mormons who ransacked and destroyed William Laws printing press because he dared to publish the truth about Joseph Smith’s polygamy. This is why Smith ended-up in the Carthage Jail where another “mob” killed him. I was one of the ones early on in this thread catching the “mob” reference of Monson. I don’t know his intent but knowing how Mormons operate, I’m suspicious. They were envious/jealous that He was taking away their power from the people because more and more people were leaving them and following Jesus. They needed something to accuse Him of so they arraigned Him from the Garden of Gethsemane and held a trial. They found a number of people that would bare false witness against Him but none of these stood up, but finally they asked Him about if He was The Christ, the Son of God, and found Him blasphemous in His answer. Since they did not have the authority to condemn Him to death they took Him to Pilate and had the mob call out for His death. OK, I am beginning to understand what you are saying. As far as the ‘angry mob’ phrase goes, I have been thinking about it and I don’t remember that actual phrase being used in lessons here where I live, we just refer to it as a mob. I don’t know what its like in your neck of the woods. I just love how Mormons throw out Haun’s mill whenever the Mountain Meadow’s Massacre is mentioned. Sorry Ralph but it wasn’t an angry mob who committed that atrocity. It was the Malitia that Governer Boggs called upon to restore peace. Read about the mormon war if 1838. Please educate yourself. What did the Mormons do that caused the governor to call out the Malitia? What did the Mormons do that caused the militiamen to retaliate at Haun’s mill? Was it right? No, but let’s call a spade a spade. It was the militia that killed at Haun’s mill, not an angry mob. And please refrain from justifying Mountain Meadows because of the mormon war of 1838. 6. the Mob, Mafia (def 1). 7. Sociology. a group of persons stimulating one another to excitement and losing ordinary rational control over their activity. I believe that a group of militia conforms to definitions 3 and 7. When you read what happened at Haun’s Mill, where people who were unarmed and had surrendered were shot point blank and children younger than 12 years old were shot point blank, and all this happened after an armistice had been called and agreed on by both sides, don’t you think that was illegal even if it had the authorisation by Gov. Boggs? If so than that also conforms this mob of militia to definition 2. So while it may have been a cohort of militia, it can still be properly defined as a mob. And before you say it, I do know there were LDS armed and fighting at Haun’s mill, but there are eye-witness accounts of a number of men surrendering and handing over their weapons only to be shot by their own rifle immediately – that is what I mean in my statement above. I understand the definition of a mob and I don’t agree with you about the Malitia. I simply find it annoying when Mormons haul out Haun’s mill like it somehow justifies what Mormons did at mountain meadows. Why didn’t you answer my actual questions? What did the Mormons do that led Governor Boggs to call out the Malitia? What did the Mormons do that caused the Malitia to retaliate at Haun’s Mill? My point is that there were atrocities on both sides during the mormon war of 1838. What atrocities did the Baker/Fancher party commit against the Mormons at Mountain Meadows? How many men, women and children did Mormons kill at Mountain Meadows? I’ll tell you, 120. There is no comparison between Haun’s Mill and Mountain Meadows but Mormons love to link them. That bothers me. You church isn’t always right and your church doesn’t always do right Ralph. Telling members the truth about the Mormon war of 1838 is something the LDS church has never done. I wonder if they group that into their “Lying for the Lord” pile.